Come January 1, many Americans will create New Year’s Resolutions like eating better, spending more time with family and enjoying life more. Come January 1, many Americans will create New Year’s Resolutions like eating better, spending more time with family and enjoying life more. Resolutions are a great idea in theory, but they’re often forgotten by February. Instead of attempting to overhaul your lifestyle in an extreme way, try adopting a mantra of working towards simplifying your life, including your cooking habits. You may find that you can achieve all of your resolutions, well, simply. Working towards a healthier, happier you is beneficial to yourself and your family, but we all know the reality of how a normal weeknight ends. Going grocery shopping gives way to working late, and it becomes easy to bypass the gym when you need to pick up the kids at school. According to the Hartman Group, 63% of food choices are decided within one hour of consumption and 30% of the top 25 supermarket growth categories are in the chilled or perishable categories (fresh “fast” food). Our society continues to evolve from a cooking culture to an eating culture. Hartman Group goes on to say that 77% of all eating occasions involve at least some prepared food. Although we all may enjoy watching competitive chefs on Chopped or Top Chef create tantalizing, “craveable” dishes­­, many of us only dream about eating it, not cooking it ourselves. Overall, we as consumers are spending less time meal planning, but have higher expectations for food and ease of preparation. With our busy lifestyles, it would be hard to break this habit, but the choices we make within that hour timeframe can be changed. 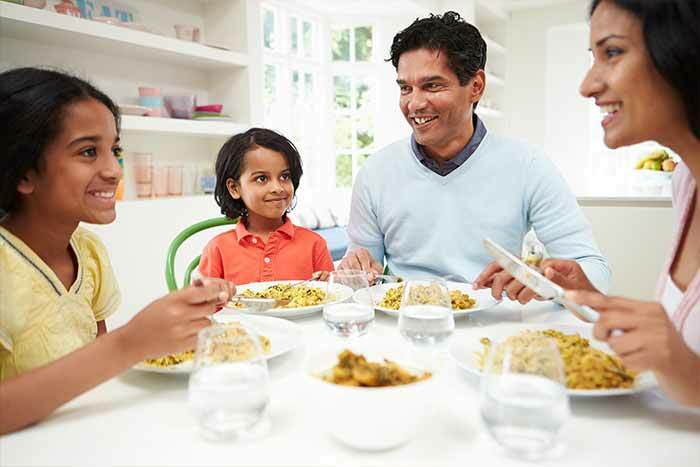 Instead of heading to the fast-food drive thru line, preparing simple meals at home or picking up ready-to-eat healthful foods are both viable options for weeknight dinners. • Easy: If you have some time to prepare a meal, there are some excellent ready-to-use components now available at your grocer. For example, in the protein section, you may find a pack of pre-seasoned curry chicken slices that simply require heating in a skillet. Finish it with easy-to-make rice and heat up a serving of frozen plantains for a complete meal. If that is still too time-consuming for a busy night, opt for ready-to-heat dishes like Kashi’s Mayan Harvest Bake, a simple way to get whole grains and nutrients without spending hours over the stove top. The key in all cases is to opt for plates that contain a mix of protein, starches and fruits and/or vegetables in order to be truly nutritious. • Easier: In addition to the grocery store, specialty stores like Whole Foods and Fresh Market have upscale delicatessens where you can choose customized take-home dishes in a variety of cuisines. For example, add your own flair to finish off the meal at home before serving. Try adding your favorite seasoning or sautéed crimini mushrooms to complement and add your own flavor for your family. • Easiest: There are also some great, healthful takeout options from restaurants today. Instead of drive-thru fast food, try the Whole Grilled Chicken Meal from Pollo Campero. This meal serves three to four people and includes two family-style sides, including black beans, sweet plantains or coleslaw along with your choice of tortillas or dinner rolls. By setting a goal in the New Year to simplify your cooking life, you can take smaller steps towards your ideal lifestyle. Start by feeding your body and soul with simple, healthful meals that are easy to prepare. You’ll then have more time to sit at the table with your family and have a conversation, which, you’ll find, makes everyone feel happier. Cheers to a happy, healthy and simplified new year! Need some inspiration? Check out our recipes page for meal ideas!